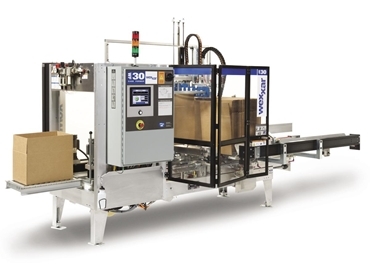 Providing users with a flexible and reliable system that is capable of handling materials of varied quality, WF30 box formers from Live Industrial have been designed to deliver enhanced control over high speed box forming tasks. The units can be quickly and easily adjusted to process packaging lines of different dimensions, and feature a colour-coded, tactile guide that allows for more efficient and straightforward operation. Variations in corrugated quality are processed by an electro-mechanical servo system that ensures accurate box forming and squaring. WF30 box formers are also equipped with a case squaring system that monitors squareness throughout the forming process, ensuring accurate forming. These units can be supplied for use with pressure sensitive tape case sealers or hot melt glue forming. Machine diagnostics can be carried out where network capable systems are available via an Allen-Bradley CompactLogix control platform with built-in Ethernet connection.